The new Colgate Smart Electronic Toothbrush uses Apple ResearchKit with the user's permission to crowdsource toothbrushing data so the company can "anticipate the future of oral care." Designed with the help of dentists, the Colgate Smart Electronic Toothbrush E1 features real-time sensors and artificial intelligence algorithms to detect brushing effectiveness in 16 zones of the mouth. The Colgate Connect app is integrated with Apple ResearchKit, and connects to an iPhone or iPad with Bluetooth. It features a 3D brushing coach to create a custom oral care routine for the user while encouraging better brushing habits. 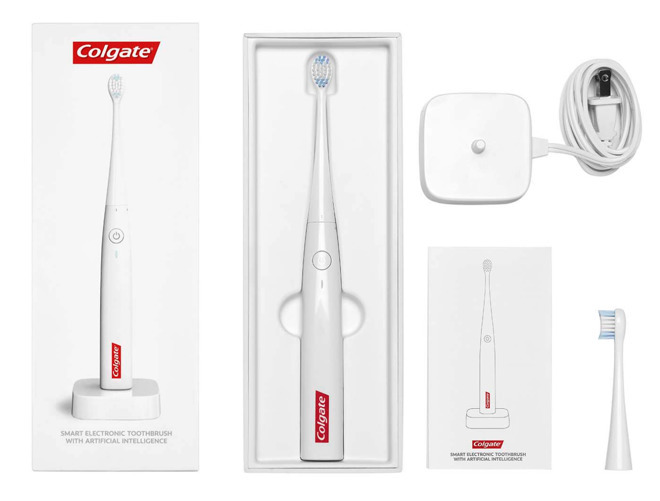 "Connected health devices like the new Colgate Smart Electronic Toothbrush provide a valuable opportunity to enable people to monitor their health and wellness," said Colgate-Palmolive Chief Technology Officer Dr. Patricia Verduin. "Using Apple ResearchKit to expand the boundaries of oral care is a testament to Colgate's drive to create innovative solutions that help people take better care of themselves." The toothbrush itself was designed by Kolibree, the same company that debuted the Magic Toothbrush on Monday that uses augmented reality to gamify children's oral hygiene.